identify the configurations. Examining the images of the launchers and spacecraft we find an excellent cross-section of the past 50 years. There are three configurations that have variable-geometry features employing retractable straight wings for improved landing and takeoff, i.e., numbers 2, 10 and 11. All of the spacecraft are delta planforms, except for Harry Stine's horizontal takeoff and landing concept, number 3. Configurations 5, 7 and 9 are two-stage-to-orbit (TSTO) concepts that are very similar. The German "Saenger" configuration (7) by MBB employs a hypersonic glider that carries onboard the propellant necessary to achieve orbit, maneuver and return. Lozinski (5) and Dassault (9) both have a different philosophy from MBB with respect to the propellant to reach orbit. In their studies it was more economical to carry the ascent propellant in an expendable rocket and to carry maneuver and return propellant on board the spacecraft. In fact, the question of propellant has many answers, depending on flight rate, and has yet to be determined today. If the flight rate postulated as needed in 1965 were real (74 flights per year) the answer would probably favor the MBB approach. All three of these designs had the idea to use the first stage (which staged the second stage at Mach number from 6 to 7) for a Mach 4.5 to 5 hypersonic cruise aircraft. If sub-cooled liquid methane were substituted for the hydrogen, with the same total energy content, the methane would occupy only 36% of the hydrogen tank volume. The 64% of the hydrogen tank would now make a perfectly well insulated cabin for either carrying cargo or human passengers. The useful range of such an aircraft would easily be in the 6,500 nautical mile (12,040 km) category. Of the vertical launch rockets in Table 1.1, one is expendable, the Vostock launcher from the former USSR. The Vostock launcher is designated SL-3. The growth version of this launcher is the SL-4, the Soyuz launcher. It is in fact from the former USSR, as the companies that supply the hardware and launch facilities for the Soyuz are now in separate nations. However, it is show because Soyuz has achieved the launch rate required to support the 1965 space station (it is noteworthy that in 1991 there were 92 launches from the three Soyuz pads at the Baikonour launch facility). The other two, the MDC Delta Clipper and the GD Millenium Express are intended to be sustained use vehicles, although not at the rate required to support the 1965 space station. Reusable vertical launch vehicles are important because they can lift heavy payloads to orbit when required by the mission, such as orbital assembly of space stations, or of the deep space and Mars vehicles represented by configuration 17. We have now established that the launchers and propulsion to get to Earth's orbit is neither beyond current capability (nor was it beyond 1965 capability!) nor limiting in establishing a space transportation system or infrastructure. So now it is to the future to achieve the dreams of the past generation. Still in the context of reusable versus "throwaway" launchers, it is a fact that the expediency of launching another expendable rocket historically has always won over the will to develop a commercial, sustained-use, multiple-launch spacecraft. As a consequence, the current "progressive" path is still an expendable rocket, albeit with some parts reusable. 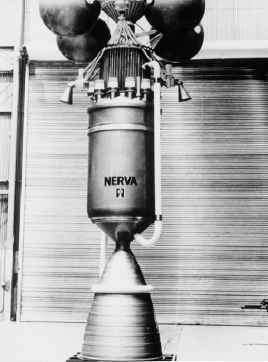 In October 1999 at the International Astronautics Federation (IAF) Congress in Amsterdam, an IAF paper reported that US-Russian cooperation resulted in a hydrogen/oxygen rocket engine (the RD-0120, in the Russian classification) for the Energia launcher that had been fired on a test stand for 80 simulated launches and returns, with a throttle up during ascent to 135% rated thrust (the US Shuttle engine, the SME, throttles up to about 109% rated thrust). A manager from one of the US rocket launcher companies exclaimed, ''This is terrible, we would have lost 79 launcher sales!" [Davis, 1999]. That explains why sustained operational use spacecraft never developed. The rocket launcher organizations never proceeded along a path analogous to that taken by the Douglas Aircraft Company with the DC-3, DC-4, DC-6, DC-7 and DC-8 commercial transport family, to cite one example. From 1934 to 1974 this series of commercial transports went from reciprocating engines with propellers, with 150 mph speed and 1000 miles range, to gas-turbine-powered jet aircraft, flying for 7,000 miles at 550 mph. In the 50 years from the first artificial satellite (Sputnik) the launcher is still the liquid-rocket-powered ballistic missile of the late 1950s. The aerospace establishment has forgotten the heritage of its pioneers and dreamers. It has forgotten to dream, preferring to rely on a comfortable status quo (and certainly perceived safer by shareholders). These historical motivations and current perceptions will have to be reassessed if man is to travel in space for longer distances than those typical of the near-Earth environment. A synthetic description of distances and time in our Solar System and our galaxy will illustrate this point. Figure 1.2. 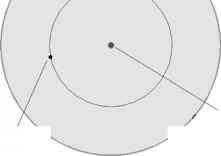 Diameter of the Sun compared with the Moon's orbital diameter.